C-CRETE HF is used as a non-slip, coloured mortar coating for industrial floors with high mechanical and hygienic demands. 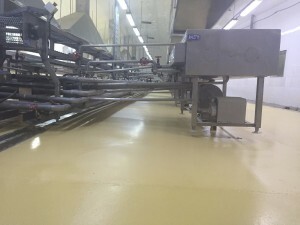 C-CRETE HF floors are capable of withstanding extreme stress, changes of temperature, and also exhibit a good wear resistance and an outstanding resistance to chemicals. Areas of use are heavily used commercial surfaces, slaughterhouses, wet processing areas of the food industry, food and beverage storage areas, tobacco processing plants, production plants for printed circuits, chemical production plants, pharmaceutical production plants and others.